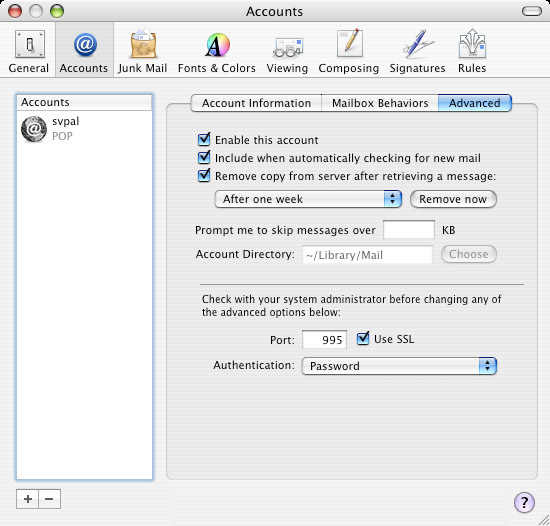 The following instructions guide you through enabling SMTP AUTH for Mac Mail on Mac OS 10. This has been verified on Mac OS 10.3, but should be very similar for all versions of Mac OS 10. Follow the instructions for Mozilla Thunderbird if you use that software. Follow the instructions for Outlook Express if you use that software. Follow the instructions for Eudora if you use that software. In this section we enable SMTP AUTH and SSL. SMTP AUTH allows you to prove you are a legitimate subscriber by providing your user name and password when you send email. This prevents outsiders (mostly SPAMmers) from using our servers to send their SPAM messages. SSL encrypts communication between your computer and our mail server. This keeps your password secure and provides some privacy protection for your email messages. Start up the Mac Mail program if it's not already running. Under the Mail menu, select Preferences to bring up up the Mail Preferences window. 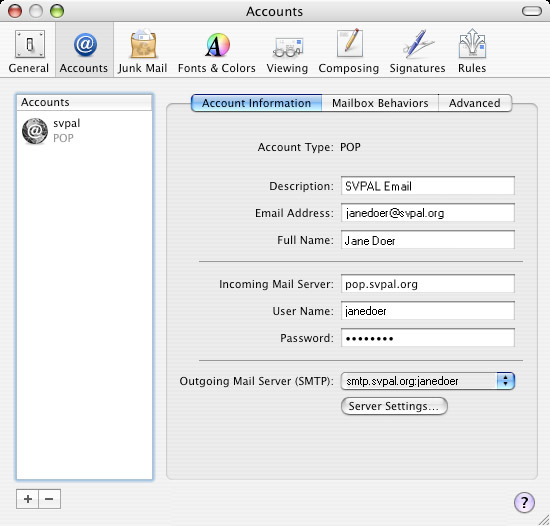 On the Mail Preferences window click on your SVPAL account on the left side of the window. Then click on the Account Information tab to show the details of your SVPAL account on the right. Settings not mentioned here may be set as you prefer. 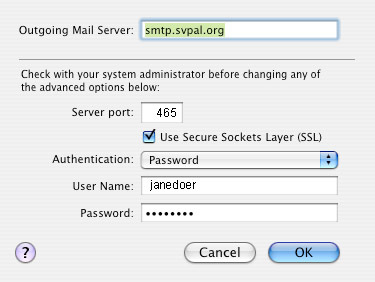 Now click the Server Setting button to bring up the SMTP Server Options window. Now click the Advanced tab on the Accounts window. Close the Mail Preferences window and proceed to test out your new settings.